Even if you're not a "Bourdainophile," you should probably listen up when Anthony Bourdain serves up sage eating/drinking/traveling advice on his CNN show, in magazine interviews, and via social media posts like his recent list of "crimes against food." Chances are he's been to more places, tried more foreign and bizarre foods, and made way more Guy Fieri jokes than you ever will. Oh, and you probably shouldn't question a gold medal-winning Jiu-Jitsu champion. And in a new interview published by Bon Appetit this week, the Parts Unknown host was asked where in the world he thinks people should visit now. His answer? Beirut. 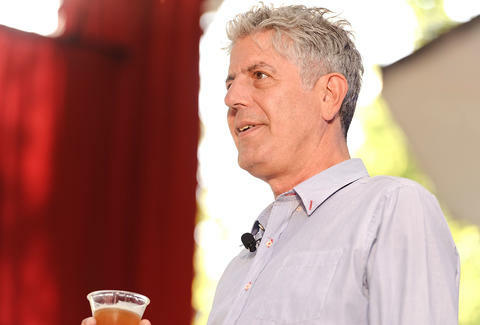 "The food’s delicious, the people are awesome," Bourdain said of the Lebanese capital city. "It’s a party town. And everything wrong with the world is there. Hopefully, you will come back smarter about the world. You’ll understand a little more about how uninformed people are when they talk about that part of the world. You’ll come back as I did: changed and cautiously hopeful and confused in the best possible way. Travel at its best defies expectations. Yes, it’s divided. There are Shia neighborhoods, Christian areas -- but they all go to the same restaurants. You can go from bikinis by the pool to Hezbollah in an 8-minute cab ride. They all coexist in a weird way. That’s part of the thing that makes Beirut so interesting." Bourdain, unsurprisingly, recommends doing a lot of eating; particularly, the city's seafood and fast-food shwarma. And as with every Q&A style chat with the wandering celebrity ex-chef, the rest of the Bon Appetit interview includes several other gems, including his strong opinion on fancy coffee and airplane food, where he likes to grab a pastrami sandwich in NYC, and perhaps most helpful, his advice on how to navigate street food and drinking in a new city. Read the whole thing right here. Tony Merevick is Cities News Editor at Thrillist and needs to get his act together and travel outside the country sometime soon. Send news tips to news@thrillist.com and follow him on Twitter @tonymerevick.